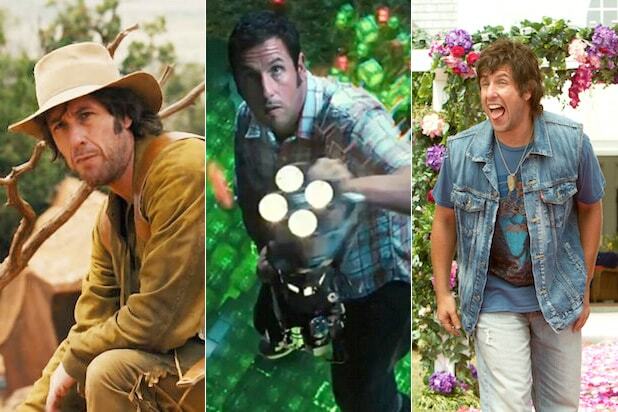 Adam Sandler has starred alongside some interesting characters throughout his career, and for his latest film, “The Ridiculous 6,” he had to share the screen with a horse. Sandler was joined by co-stars Terry Crews, Jorge Garcia, Taylor Lautner, Rob Schneider and Luke Wilson on “Jimmy Kimmel Live!” where the cast dished on getting down and dirty on the set. 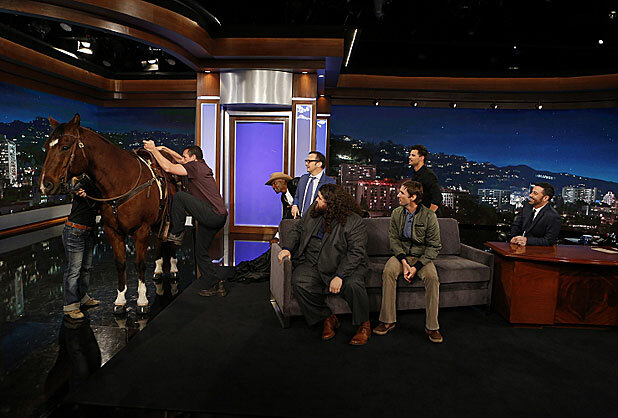 While he plays a cowboy in the Netflix screwball comedy, Sandler was far from comfortable in the saddle and grimaced when Jimmy Kimmel brought out a real-life horse on set and asked him to get on it. After admitting it took him 25 lessons just to learn to mount a horse, the Brooklyn-born comedian did manage to pull himself up and wave a cowboy hat as he walked awkwardly around the stage. Along with swimming in dirty ponds with tadpoles and hanging upside down, “Twilight” actor Lautner did a lot flips during the shoot and showed off his acrobatic move for Kimmel (pictured below). The comedy about a goofy gang of multicultural brothers — with Sandler playing an outlaw raised by Indians — was at the center of a racial controversy earlier this year when several Native American actors stormed off the set to protest their depiction in the script. Frank Coraci (“The Wedding Singer”) directed from a script that Tim Herlihy co-wrote with Sandler, who is produced along with Allen Covert. Happy Madison’s Heather Parry and Barry Bernardi are executive producers on the film, which will debut exclusively on Netflix in all territories. “The Ridiculous 6” is set to premiere Dec. 11 on Netflix. “Jimmy Kimmel Live!” airs at 11:35 p.m. ET on ABC.